When you approach the shaded entrance to The Hilton Garden Inn, located in the Ybor Historic District in Tampa, Florida, you know you're in for a treat. Just 2 blocks from the famous 7th Avenue; and convenient to the Port of Tampa, Busch Gardens, and Tampa International Airport; the Hotel is a peaceful Oasis. The Palm trees that line the front entrance also accent the swimming pool and hot tub area. The refined elegance of the lobby will make any guest feel like royalty. With cool shades of white with gold trim and accents, guests are treated to an ambiance of a crisp, clean tropical hideaway. The Hilton Garden Inn boasts that they "think of the details so you don't have to." With all the amenities and style offered here, you might forget you're on vacation and think life really is this sweet. The clean and crisp decor of the lobby areas is carried through into the guest rooms. Rooms are warm and inviting with all the modern technological conveniences you'd expect from a four star hotel, like complimentary internet access, cable TV, in-room telephones, and a large work desk. Guests can choose from one King sized bed or two double sized beds. Suites are available as are rooms with handicapped access. They really have thought of everything. The Hilton's Pavilion Pantry stocks all the necessities you might have forgotten, from from Tylenol to microwaveable burritos. For families, they keep high chairs and cribs available. 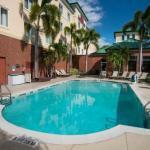 Guests are welcome to use their swimming pool, whirlpool and fitness center. For the business traveler, they offer a business center complete with copy machines, meeting rooms, printing services and audio visual equipment rental. They offer room service, laundry service, a lounge and restaurant and a news stand. Parking: Yes, there is parking. Parking is available for a fee.